Shrimp cocktail has many recipes and the shrimp cocktail I tasted at the Billy Martin’s Tavern was simple wonderful. Spicy shrimp and great tasting cocktail sauce. 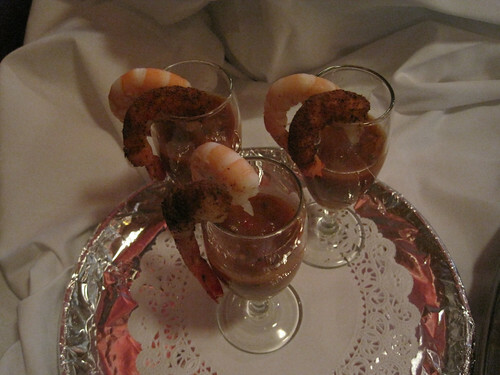 Many decades ago when I was cooking in kitchens we made shrimp cocktail on a bed of lettuce and the cocktail sauce had a base of mayonnnaise, tobasco and Worcestershire sauce and the shrimp was mixed into the sauce and decorated. That was the old way before looks became more important for food and presentation improved. This shrimp cocktail was elegantly prepared and since this was buffet style I am happy that Billy Martin’s Tavern did a great job with the service and replenishment. Do you have any favorite Shrimp cocktail recipes ? Ever had Mango Shrimp Cocktail?